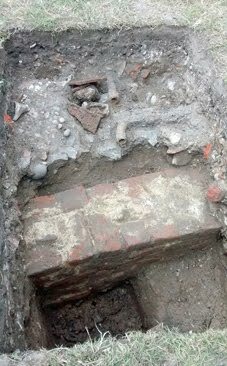 Tuesday 10th October 2017: ‘The Curtain’ Playhouse Excavations, by Heather Knight, MOLA. Lectures are held at Avenue House, 17 East End Road, Finchley, N3 3QE, and start promptly at 8pm, with coffee/tea and biscuits afterwards. Non-members: £1. Buses 13, 125, 143, 326 & 460 pass nearby and Finchley Central station (Northern Line), is a 5-10 minute walk away. Our Membership Secretary, Stephen Brunning reminds all those who have not paid that the membership year runs from 1st April; if you have overlooked this please send him your subscription. And if you do not wish to continue membership (though why should anyone want to leave our fine society?) let him know so that he need not remind you personally. Barnet, in common with most, but not all, local authorities, has a Schedule of Buildings of Local Architectural or Historic Interest - ones which while not benefitting from the statutory protection provided by the national list, are given particular status in Barnet’s Local Plan and in dealing with planning applications. The Council has just initiated a review of this list, and is inviting community engagement in a borough-wide survey of local heritage, including surveying the existing list entries and identifying potential new items. There are to be free training events for all volunteers and volunteer support throughout from the dedicated project team which the Council has set up with a consultancy called ‘Urban Vision’. Unlike some archaeological societies (and in particular the Council for British Archaeology) HADAS has tended in its work (though not in its lectures or visits) to prioritise archaeology beneath the ground over that embodied in standing buildings. Our Society, unlike the Finchley Society, the Barnet Society and others covers the whole of the borough, and we must have many members who are at least as interested in the built heritage as in the buried heritage. This is an opportunity for them to undertake some research, and I hope many members will take part – see details over-page. Avenue House, and on Friday 7th July, from 10.30 am to 12 noon in Christ Church Barnet (St Albans Road EN5 4LA). To book a place or register an interest in future training events elsewhere in the borough email Hannah.barter@uvns.org or call her on 01538 386221. The 56th Annual General Meeting was held on Tuesday 13th June 2017 at Avenue House. The meeting was attended by 38 members and 2 guests. This was a better attendance than the previous year. Apologies were also received from a further 26 members after a reminder email was circulated. The Chairman, Don Cooper, opened the meeting and welcomed all those present, including the President Harvey Sheldon and his two colleagues, Jacqui Pearce and Robin Densem, who were to assist him later. The President then took the chair to conduct the business of the meeting. Chairman: Don Cooper; Vice-Chairman: Peter Pickering; Hon.Treasurer: Jim Nelhams; Hon. Secretary: Jo Nelhams; and Hon. Membership Secretary: Stephen Brunning. The current six Committee members were also prepared to stand again: Vicki Baldwin, Bill Bass, Roger Chapman, Eric Morgan, Andrew Selkirk and Sue Willetts. Two further members offered themselves to serve: Melvin Dresner and Robin Densem and all were unanimously elected. It was pointed out that all the present officers had been in their posts quite a long time. The Chairman and Treasurer both over ten years and all the others not far off ten. We still have no volunteers prepared to try to organise an outing other than Jim and Jo Nelhams, who are still arranging the 5-day long trip each year. Without organisers the Society would not exist. It was recorded that one of our Vice-Presidents Mary Phillips had died earlier in the year. The Chairman thanked all for coming and all those who contribute to the various activities that the Society offers. The meeting closed at 8pm. The Chairman invited all to have a break for tea or coffee before the presentation of the Lant Street dig by the President, Harvey Sheldon, Robin Densen and Jacqui Pearce. Jacqui tutors the Finds Class who have been studying the Lant Street finds. The Finds Class will be continuing to study the Lant Street finds when they reconvene on Wednesday October 4th at 6.30pm at Avenue House. There are spaces for one or two more at present. See page 9 for further details and how to apply. The search for, and ultimate discovery of, a treasure lies at the heart of many an adventure story. Dr. Hazel Forsyth’s lecture The Cheapside Hoard: A World Encompassed revealed a true story of many links that outshines the fictions. Discovered in 1912 and comprising 500 items, it is the world’s largest collection of Elizabethan and Jacobean jewellery. Every piece is gold and the hoard includes ingots, specie and recycled plate. The gems themselves reflect the trading networks of the period: emeralds from Colombia; diamonds; Burmese rubies; malachite; almandine garnet; lapis lazuli from Afghanistan; Persian turquoise; pearls and opals, as well as some Renaissance gems. In addition, fake stones created from heat-treated quartz point to the shadier side of the gem trade. The hoard was found in the cellar of a late 17th century post-fire, timber-framed building at 30/32 Cheapside by workmen who sold some of the jewellery to a dealer, George Fabian Lawrence (Stony Jack). He was known to buy interesting finds from the building sites and had been appointed by the Guildhall Museum to add items to their collection. Lewis Vernon Harcourt, 1st Viscount Harcourt, provided funds for the London Museum to purchase the hoard and asked for it to be brought to his private residence. King George V and Queen Mary visited and the Queen was given a necklace (subsequently recovered!). The hoard was declared to be of national importance. During the period, the hoard was being accumulated, Cheapside was the centre of the luxury trade in London and the widest street in the capital. It is thought the collection was the working stock of one of the many goldsmiths working there before the Great Fire in 1666. It will never be known why it wasn’t recovered by its owner, but the box remained hidden in the cellar during rebuilding in 1667 until its discovery in 1912. Before being hidden in the Cheapside cellar, it is possible much of the hoard had been amassed by a Dutch jeweller, Gerard Polman, who brought it back from the East Indies in 1631. He died on board ship and the carpenter’s mate acquired Polman’s chest but was forced to relinquish it to the Treasurer of the East India Company. How it ended up in Cheapside is uncertain. The hoard is spectacular and contains items that are closely datable. Stylistically, most belong to the late16th century/early 17th century when the gem took pride of place and settings were fine and delicate. Some of the gems are foiled to make them glow. There are bunches of emerald and amethyst grapes; rings; a scent bottle set with Hungarian opal plaques. A 4.5 metre chain was intended to be worn looped around the person. Dated to 1612 is the only known watch by Gautier Ferrite, set into an emerald the size of a small apple. An heraldic badge for a ring is perhaps the latest datable item. It depicts the arms of William Howard, youngest son of the Earl of Arundel, made Viscount Stafford in 1640. During the Civil War their gem collections were requisitioned and pawned in Cheapside. The hoard must therefore have been buried after 1640 and before 1666. Dr. Forsyth’s lecture provided us with fascinating insights into the complex and somewhat shady world of gems and jewellery in the first half of the 17th century. Excavations at Clitterhouse Farm, Cricklewood by HADAS 2016. Clitterhouse Farm, Claremont Road, Cricklewood, NW2 1PH. Site code: CTH16, NGR: TQ 2368 8684, SMR: 081929, Site investigated July/August 2016. For background on this project please see HADAS Newsletters 539 (Feb 2016), 542 (May 2016), 543 (June 2016) and 544 (July 2016). Clitterhouse Farm, a moated manor site, has a long-documented history. Archaeological research work is being carried out to try and establish the Saxon/medieval and later layout of the site. Following on from work here in 2015, a resistivity survey and further 3 trenches were excavated outside the northern corner of the main building complex in the summer of 2016.
c. 1900-1910. It was decided to carry out a resistivity survey on the grassy land here. The results showed a variation of high and low readings which could be interpreted as rubble/walls, and with what could be a service trench (water or similar) cutting through at a SW-NE alignment. Trench 1 (2 x 2m) was laid out to take in some of the various resistivity readings some 2m away from the present building. A further two smaller trenches were excavated in front of the NE range near the door of the ‘Farm Cottage’. The north corner of Clitterhouse Farm showing the position of the trenches; the arrows are indicating the walls (and their alignment) as excavated in the trenches. The 2 x 2m trench was started at level 57.45 OD. The turf and modern topsoil  was up to 20cm thick; beneath this were further mixed sub-topsoils [002 & 003] of a modern date, approximately 30cm thick; inlaid into these and running SW-NE along the middle of the trench was a gravelly mortar feature with ‘shuttered’ sides which may have been a previous path or concrete ‘ducting’. The next layers encountered contained a mixture of mortar/clay, some chalk and gravel, and notably [007/8] was of a redeposited clay mixed with a dense rubble demolition deposit of brick (loose and coursed), and mortar with roof tile including peg- and pan-tiles, some 40cm thick. This demolition deposit contained a wide variety of pottery but would seem to date to the 19th century. On the western side of the trench this layer had been disturbed by a ‘cut’, which turned out to be for a water or sewer pipe running E-W along the trench about 80cm down from the surface. ‘header’ bonding; it had a right-angle return in the middle of the trench and exited west towards Trench 3, each length of wall as seen was approximately 1.40m. About 3-4 courses of the wall were seen; it would seem a comprehensive job of demolition was carried out truncating most in situ deposits in this area – were the bricks reused in the subsequent rebuild of the farm? Butting up to the southern return of the wall was a single brick course leading south to the SW corner of the south of the trench. There is evidence of a plinth on the internal face of the main wall, an indication perhaps that it is near the foundation, but we could not fully expose the full extent and depth of the wall due to time constraints and we did not get down to ‘natural’ for the same reason. The fairly modern water-pipe mentioned above cut through the southern return section of wall. 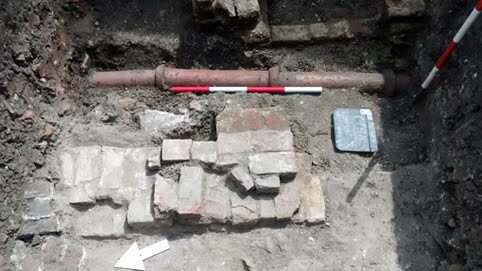 Samples of brick were taken from the wall in Trench 1 [009 & 011]. A whole brick taken from the northern half of the wall measured L8½" x W4" x Th2⅜" (224mm x 100 x 60), it was roughly made, hand-made (in a mould?) and showed little or no sign of a ‘frog’ (an imprint in the surface to lighten the weight and help key the mortar). A nearby half-brick of similar dimension, but thicker at 2¾", appeared better made with sharper edges with a shallow frog. A whole brick from the single wall line  measured L8⅜" x W41/16" x Th2½" (224mm x 102 x 65). It was fairly well made with no sign of a frog. A further brick from the main wall measured 8⅝" x 4" x 2⅝" (220mm x 100 x 67), fairly roughly made with cracks and inclusions. Several brick types may be seen, due to any rebuilding, repairs or such like. Herts Ware (ESHER 1050-1200AD) and Late Medieval Glazed Herts Ware (LMGH 1340- 1450). 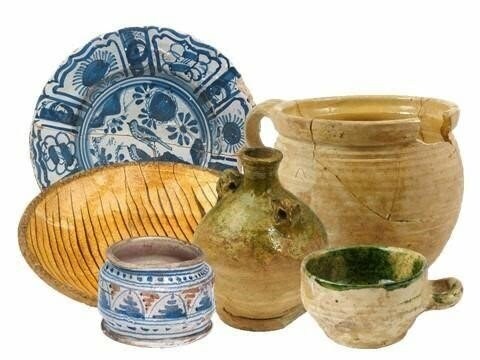 There are sherds of later Post-medieval Redwares and Slipwares, English Stonewares and various 19th century Transfer Printed and porcelain pottery. Other finds include corroded iron work, window and bottle glass and small amounts of animal bone, a fragment of clay tobacco pipe bowl dated 1680-1770 (form AO17), and a further bowl dated to 1700-1770 (form AO25). A large amount of roof-tile and brick rubble was seen but for the most part discarded. An unusual clay-pipe stem (Trench 1, context 002) has a face with an elaborate ‘feathered’ headdress mould on it, not dated at present. Trench 1, showing the return wall and water-pipe cutting through. North is to the left. (See also Part 3, Site phasing – HADAS Newsletter number 543 June 2016). 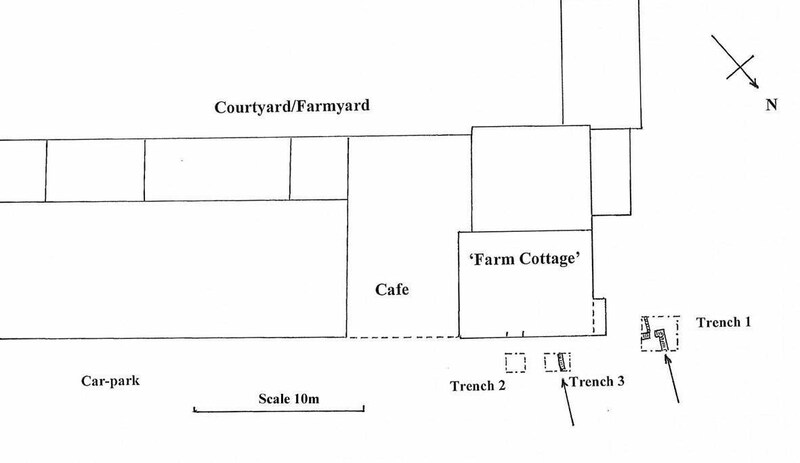 The slightly different alignment of the walls as excavated in Trenches 1 & 3 from the present main farm alignment (see plan above) is reflected in several maps/plans, especially the Bart’s Archive SBHB/HC/45/19 which shows a proposed rebuilding of the site c 1790-1816 and mentions ‘Old Cow House must be pulled down’. Whether the Old Cow House was pulled down at this time is a matter of conjecture and is difficult to see from the maps, but the offset wall lines do appear to be those of this structure. So are these the brick footings of the timber-framed ‘Old Cow House’ seen on the illustration of 1715 SBHB/HC/45/2, or a later rebuilding c1800? The size of the bricks, a lack of a frog in many of them and the header-bond style could date our wall to the early 18th century, in which case they will be brick foundations of a timber-framed building, but more research is needed. We did not see any evidence of later rebuilding in the trench (although this was a relatively small area). This range of structures (Old Cow House and Wheat Barn) was eventually demolished c1900-1910; most of the pottery dates to the 19th century in the demolished layers, some earlier. The several sherds of medieval pottery once again perhaps hint at the earlier occupation in this area beneath the car-park. Trench 2 was placed slightly west of Trench 1 outside the doorstep of what was known as ‘Farm Cottage’, on a patch of grass we could access. Beneath the topsoil (approximately 57.20 OD) and some ephemeral mortar/concrete layers, a mixed gravelly/pebbly context appeared [003/4], mixed in with this were plenty of finds such as brick fragments, tile, slate, glass, pot, metal fragments, animal bone etc. Also uncovered was an iron-pipe running E-W through the centre of the trench; it was 5cm in diameter, perhaps a water or gas pipe. Underneath [003/4] a more compact surface was revealed made up of small to medium cobbles 20mm to 100mm diameter in a silty-sand matrix [005/6/7]; it was around 20cm thick. These variable gravel and cobble layers carried on until a more clay type context was reached at around 56.50 OD. Once again, a substantial number of finds were recovered from these deposits similar to [003/4] this time including some clay tobacco pipe. The finds were similar to Trench 1 being Postmedieval Redwares (1580-1900) and Slipwares, English Stonewares (1700-1900), sherds of Black Basalt Ware (1780-1900), some Borderware sherds (1550-1900) and various 19th century Transfer Printed and porcelain pottery. Some of the clay tobacco pipe was dated to 1840-1880 and a complete clay-pipe bowl from context  dates to 1780-1820 - it was marked W-W on the ‘spur’. An interesting find (Trench 2, context 009) was sherds of a ‘Char Dish’ in Tin-glazed or Delft Ware. Char is a relative of the Trout found in the Arctic areas and the Lake District and is processed to a paste and served in these dishes. The vessels were quite popular with a fish motif on the outside and made in a variety of pottery fabrics, Tin-glazed ones are often associated with Liverpool potteries perhaps around the mid-18th century. Essentially Trench 2 is a series of gravel and sand make-up deposits with at least one or more substantial cobbled floors in between. They seem to form a backyard, outside the backdoor of the ‘Farm Cottage’ with cobbled floors, remodelled, built-up, repaired with anything to hand - household rubbish, pottery etc, - along with other disturbances – the gas-pipe, demolition material which all dates to the 19th and early 20th centuries. This eventually was covered with thin mortar flooring which became covered with turf. observed, together with a scattering of animal bone and iron nails etc. Approximately in the middle of the trench (below), beneath the cobbled layers, the top of another wall was discovered. This brick masonry was exactly the same style and bonding as the one seen in Trench 1, the alignment was also the same. It had been demolished to a level of 56.97 OD; excavation through re-deposited clay revealed a further 6 courses which appeared to finish on the natural London Clay. The distance between the walls of Trenches 1 & 3 was 5.75m. Trench 3, North is to the left. Again many of the ceramic wares reflect those seen in Trenches 1 & 2; notably recorded was part of a female figurine found in (Trench 3, 003), she has lost her head but is wearing a flowing dress, possibly Georgian or Victorian in style, and is carrying what looks to be a parasol. A sherd of South Herts Greyware 1170-1350 was recovered from (Trench 3, 003). Essentially the same as Trench 2, but Mike Hacker comments “The well-rounded flint pebbles in the cobbled surface look as if they may well have come from the nearby deposits of Dollis Hill Gravel. One of the characteristics of DHG is that it is a poorly sorted mix of clay, silt, sand and pebbles. This makes it ideal for use as ‘hogging’ for roads and paths”. For the wall interpretation please see Trench 1. The excavations have shown that some substantial archaeology still survives around the immediate area of the farm buildings and more work is needed to confirm the plan of the excavated walls and their date. The resistivity plot shows a possibility for further walls/ archaeology nearby so there is potential for more fieldwork here. Luisa Valejo, Thomas Ball & The Clitterhouse Farm Project. HADAS Fieldwork and Post-Excavation Team. St Bartholomew’s Hospital Archive (various maps and documentary sources). Mike Hacker. Here is the new poster for our finds course which will start again in October 2017. We have still a small number of places available. This course is a wonderful way to improve your ability to recognise and identify types of pottery, clay pipes, glass and other types of finds. The objectives of this course are to identify, quantify and record the finds from Lant Street (LNT99) and well as to bring the whole assemblage up to the current standards required by the London Archive and Research Centre (LAARC). We processed nearly half the assemblage during last year’s course and were very impressed with the range and quality of the finds. It will be interesting to establish the likely date of the deposits and their relationship with the four early 19th century houses known to be on the site. This year we will continue recording the diverse and extensive collection of finds from the 1999 Birkbeck College training excavations at Lant Street in Southwark (LNT99). This rich artefact assemblage is focused chiefly on the post-medieval period, with large collections of pottery, clay pipes, glass and other items. Regular presentations and professional tuition will be provided throughout the course. This is an ideal opportunity to gain––or increase––your experience of working with and handling a wide variety of archaeological finds, as we make a complete record of the excavated material ready for deposition in the LAARC. We will also be aiming to look at the finds in the context of the site and its development over time, and will have access to the full site archive throughout the course. All are welcome, whether or not you have experience of working with archaeological finds! Course fee: £295 for 22 sessions. To book, contact Don Cooper (olddormouse@hotmail.com; tel. 020 8440 4350) or Jacqui Pearce (pearcejacqui@gmail.com; tel. 020 8203 4506). Please make cheques payable to HADAS and send to Don Cooper, 59 Potters Road, Barnet EN5 5HS. Friday 21st July. 7pm. City of London Archaeological Society. St Olave’s Church Hall, Mark Lane EC3R 7BB. From Battle Bridge to King’s Cross: the making of an inner London suburb. Talk by Rebecca Haslam (PCA). Visitors £3. Refreshments after. Monday 24th July to Friday 28th July. 2.30-4 pm. Brent Museum. Road, King’s Cross N1 9RT. There is also an exhibition until 24th September from the National Waterways Museum, Brindley 300, celebrating the life of James Brindley, our greatest, most celebrated canal engineer. Sunday 30th July. 10 a.m. Trent Country Park Cockfosters Road, EN4 0PS Camlet Moat uncovered This is an archaeologically important ancient monument, also regarded as a sacred site by mystics. Join Alan Mitellas on a tour that investigates the known history, archaeology, mysticism etc. of this fascinating area of Trent Park. Meet 10 a.m. at Trent Park by the café through the Cockfosters Road entrance. Finish approximately 12 noon. Distance 3 miles at most. £34 or £24 for National Trust members. Lunches available. Coach will pick up Camden High Street (opposite Marks and Spencer’s) at 8.45, at Hampstead High Street (opposite Waterstones) at 9 a.m. and Swiss Cottage (outside the Library) at 9.15 a.m. Contact Jean Archer, 91 Fitzjohn’s Avenue, NW3 6NX, telephone 020 7435 5490. Sunday 6th August. 2.30pm. Heath and Hampstead Society. Meet at the cattle trough and flower stall, Spaniard’s End near the inn. The Hampstead Heath Extension. Walk led by Tony Ghilchik (lasts approximately 2 hours). £5. Tuesday 8th August. 7.45 pm. Amateur Geological Society. Finchley Baptist Church Hall, 6 East End Road N3 3QL (corner Stanhope Avenue, opposite Avenue House). Members’ Evening. Talks include Green Skies and Brown Clouds on Lanzarote and Platinum, its mineralogy, extraction and applications. There is also the judging of the Golden Egg Competition (Please note that in the June newsletter the heading ‘Amateur Geological Society’ was omitted in the item for 11th July). Mark Lane EC3R 7BB. Members’ Evening. Short presentations by members. A chance to share a personal archaeological interest or a favourite site. Visitors £3. Refreshments after. Tuesday 29th August 2pm Mill Hill Historical Society. Visit to Charterhouse with guided tour by one of the brothers (lasting up to two hours), giving an insight into its history and everyday life. It has existed since 1348 and has served as a monastery, private mansion, boys’ school and almshouse, which it is to-day. There are a chapel, a museum and a café. Meet at the site. Book by Friday 11th August. Contact Julia Haynes, 38 Marion Road, Mill Hill, NW7 4AN, telephone 020 8906 0536, haynes.julia@yahoo.co.uk.